Firefighters were last night battling a massive blaze at a well-known hotel building near Dublin Airport. Up to 20 fire appliances were on the scene attempting to extinguish flames coming from multiple floors of the Metro Hotel building in Ballymun. 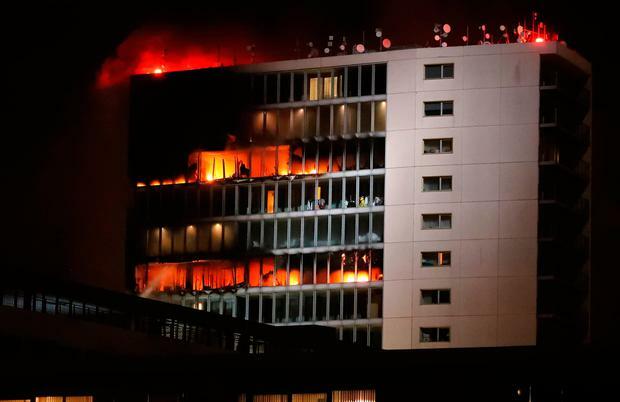 The fire broke out shortly before 8pm at the 15-storey building located at Santry Cross, with early indications that residents and staff were evacuated safely. However, Dublin Fire Brigade (DFB) had firefighters inside the building using breathing appartuses in order to search the hotel and extinguish the flames last night. After being inside the building, firefighters change their air cylinders before re-entering the building again. It is understood the fire broke out at one of the upper floors of the building, but the source of the blaze is as of yet unknown. DFB added late last night that "as of yet we have no reports of any casualties or people unaccounted for". DFB were supported by Dublin Airport Fire Services in their battle to bring the fire under control. Appliances being used to fight the blaze included eight fire engines, two aerial appliances, an emergency tender, a foam tender with command units and senior officers at the scene. A command support unit and incident support unit was set up on site. Two bus-loads of people were taken from the scene to stay at a nearby hotel. One woman living in the building said she had heard the alarm going off but just thought it was a fault in one of the windows. "I thought it was a fault in the window and I called reception to close them," she told the Niall Boylan Show on Classic Hits 4fm. "They said there's a fire, I needed to leave my home. I literally grabbed whatever. I was reminded of the Grenfell Tower, I thought oh my god, this is happening. "It was just me in the house.It was a bit shocking. I was running down and I was the only one running down. I was shocked. The alarm was going on for so long and I hadn't done anything." The woman said she hadn't even begun to think about the future and was just in shock. An onlooker told the Irish Independent: "I saw one woman crying in her dressing gown with her three children. "It started around 7.30pm and I saw a little spark and saw loads of people running out of the exists screaming help," they said. "It started at the third last floor and debris was falling off into the parking lot. The smoke hit the whole building and even went into the lifts. There were loads of people just running out." Despite initial concerns, Dublin Regional Homeless Executive (DRHE) confirmed that no homeless families were residing in the building. Housing Minister Eoghan Murphy tweeted: "I want to thank Dublin Fire Brigade who continue to battle a major fire at the Metro Hotel in Ballymun under difficult conditions. We are monitoring the situation closely."